Pittsburgh Underground: Fundays At 420: Sweet Brown FUN!!! Fundays At 420: Sweet Brown FUN!!! Greetings one and all to Pittsburgh Underground and another Fundays At 420 Tribute!!! With what feels like a shortage of everything these days (including our beloved green... gulp) this week the gang here at good ol' PU decided to get some luv and some much needed laughter with Sweet Brown!!! This internet sensation started when Oklahoma City resident, Sweet Brown, was interviewed by local news station KFOR News Channel 4 after evacuating from her apartment building that was set on fire. Her exciting tale of the chaotic scene quickly led to massive exposure on YouTube. Everything from music videos (our favorite is from AutoTune), impersonators, animation, and even some pretty sweet cameos from Sweet Brown herself as the opportunities for her keep rolling in! The gang here loves Ms. Brown and thought you should get in on all the fun this dynamic lady has started. 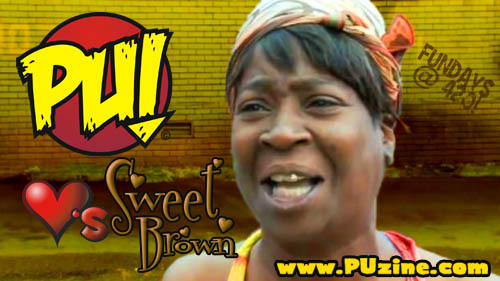 Also, don't forget to check out the Team Sweet Brown.com to see what she's up to! Baby Sweet Brown - Ain't Nobody Got Time For That!